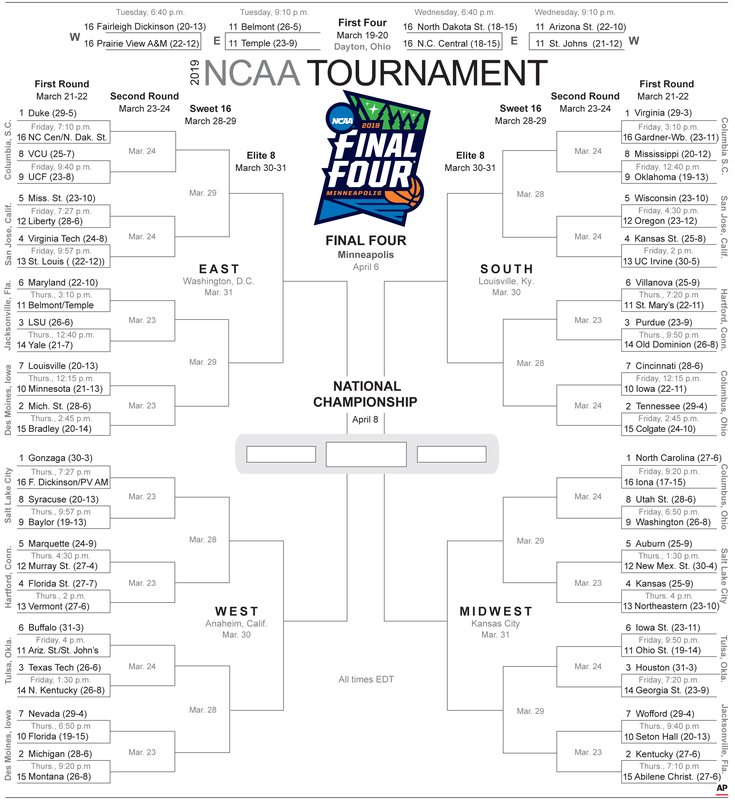 There are 9,223,372,036,854,775,808 different ways you can fill out a bracket. Or, you can just copy this one. The Perfect Bracket is more than just a bunch of game-by-game predictions – it also seeks to differentiate your picks from others in the pool by making selections that have higher value relative to conventional wisdom. 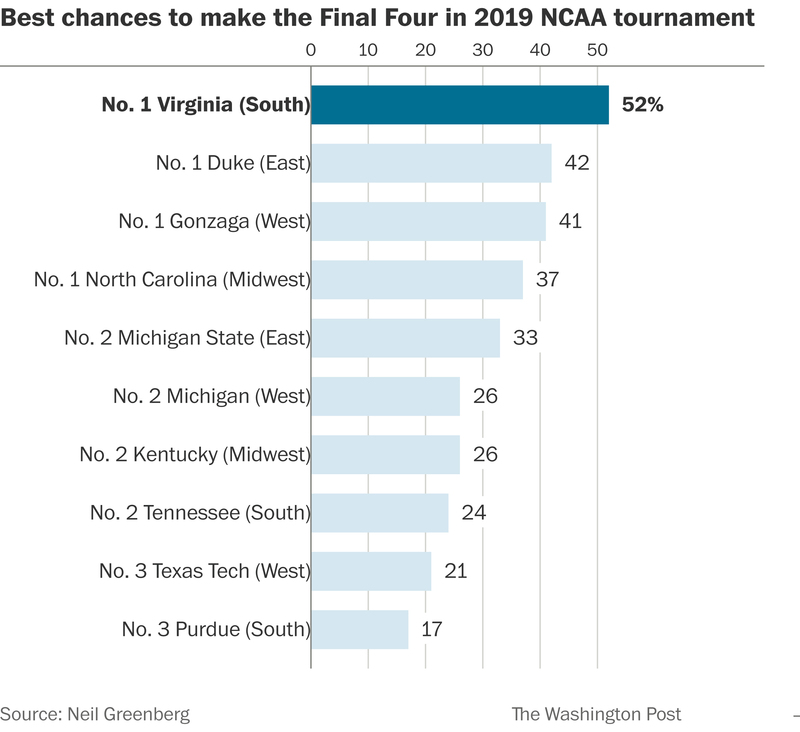 The Perfect Bracket carefully selects upsets using DAViD, the Data-Assisted Victory Detector for the NCAA tournament (click here for the full explanation of the method). No. 3 Houston had the fourth-highest NET ranking per the NCAA but was the 10th best team per the consensus ranking of 67 different metrics. Their first-round opponent, No. 14 Georgia State is one of the best three-point shooting teams (39 percent, 15th) in the country, with three players – Devin Mitchell, Malik Benlevi and Jeff Thomas – all shooting over 40 percent from behind the arc on five or more three-point attempts per game. Plus, junior guard D’Marcus Simonds, the 2018 Sun Belt Player of the Year, was named to this year’s All-Sun Belt first team after is averaging 18.9 points, 4.9 rebounds, 3.7 assists and 1.3 steals per game. His ability to score down low in the post (1.1 points per possession, including passes) gives the Panthers a versatile offense that is tough to stop. No. 5 Wisconsin could also surprise. The Badgers had a rough start to 2019 – Wisconsin lost three of the first four games of the new year – but have righted the ship and enter the tournament with the 12th best adjusted net efficiency (plus-23.7). Coach Greg Gard sees his squad take care of the ball (14 percent turnover rate on offense, eighth best), play stout defense around the rim (less than a point per possession allowed, 98th percentile) and against ballhandlers on the pick and roll (0.7 points allowed per possessions, 85th percentile), the most frequent play against them this season. Everyone will be on Duke – the Westgate SuperBook in Las Vegas has them as a 2-to-1 favorite with Gonzaga the next choice at 5-to-1 – and Virginia’s slow tempo makes them vulnerable again in the early rounds. That leaves Michigan State as a solid title contender that will also be overlooked on most brackets: less than five percent of ESPN brackets rely on a No. 2 seed to win it all. Instead, bank on one of the best teams in the tournament to fly under the radar all the way to the national title.